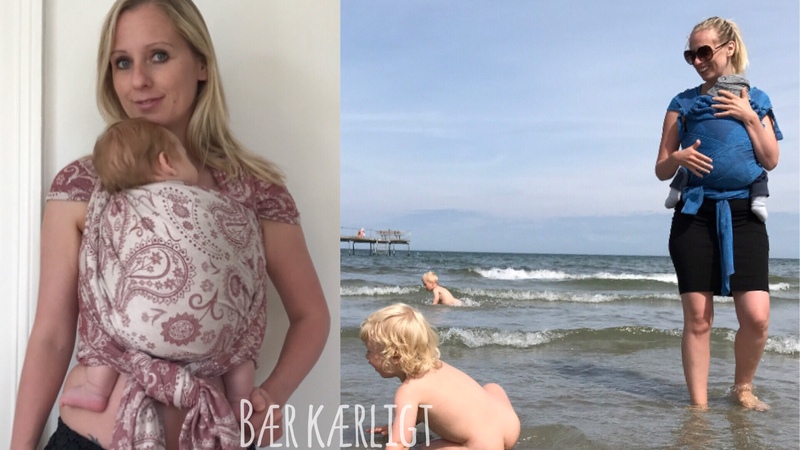 If you want to wear your child in slings, wraps and carriers in hot weather, you may find some tips here in my summer guide for safe babywearing in warm weather. When you search the internet or in different SoMe groups, it can sound like choosing the right material means it’s not hot to wear your baby in the heat. It is hot to carry your child! When we wrap 1-3 extra layers of fabric around ourselves and our child in warm weather – then it is very hot to babywear. 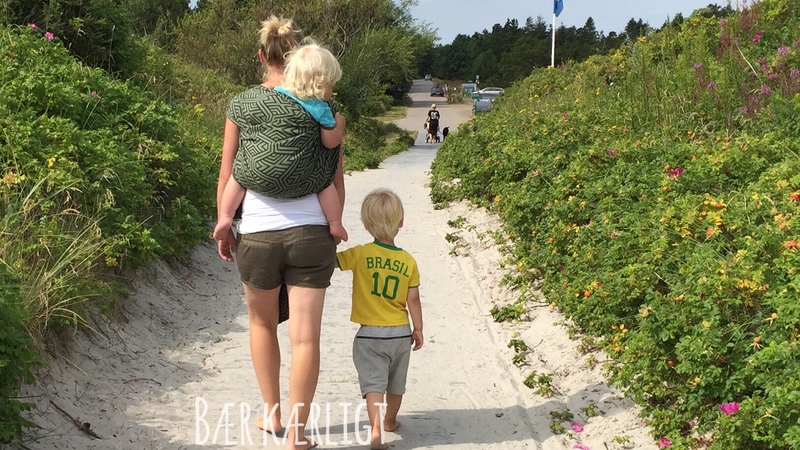 When you wear your child, you share bodyheat, no matter what material the carrier is made of. But luckily, there are options to reducing and minimizing the heat, to cool down, and to adjust your clothing to make it as comfortable as possible for you to carry your child in the summer heat. Therefore, my advice is to accept that it is warm to carry your child. Once we have acknowledged that it’s hot to carry your child, it’s important to look at safety, because when you’re carrying your child, it’s your responsibility to make sure that the child is comfortable and safe while the child is in the carrier. Make sure your child has an appropriate temperature in the carrier and remember that each layer of sling/carrier counts as 1 layer of clothing. At the same time, ensure that the child’s skin is protected from the sun – also on the body parts outside the sling/carrier (e.g. head, neck, leg and perhaps arms). Read more about safety HERE. Customize your clothes after the weather! But I have to write it like this, as the European summer is a moody cousin – it changes a lot and very often and it is definitely not warm all the time. What if it’s not 25 degrees? 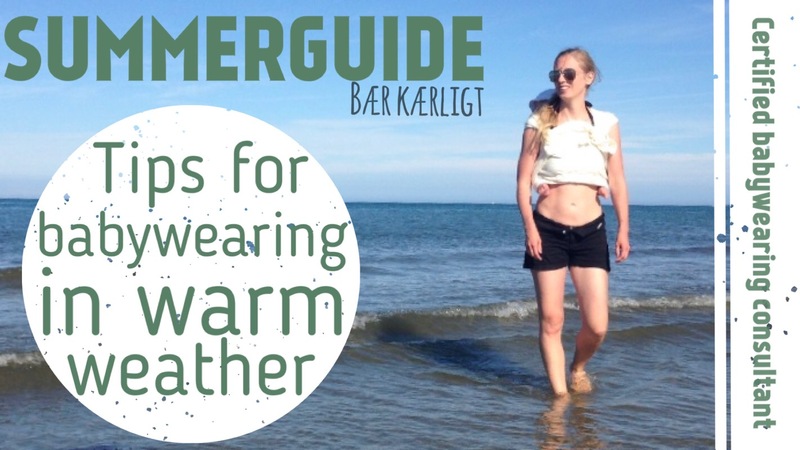 When it’s not 25 degrees outside – and let’s face it – in Denmark (where I live) 25 degrees is rare. Then it’s my recommendation that you dress yourself, as you would have otherwise. When you dress the baby, you count the sling/carrier as 1 layer of clothes. That is, you dress your child in less clothes than you would for just being outside. Why not take ALL of your clothes off under the wrap? It’s becoming quite common that it’s both healthy and beneficial to have skin-to-skin contact with your child. The love hormone oxytocin is released in both the wearer and the baby. Oxytocin creates joy and happiness while strengthening the relationship between the wearer and the baby. And when it’s warm outside it is win-win to have skin-to-skin contact in the sling/carrier. There are many ways to tie a wrap, so the wrap covers the wearer’s body, so others will not be able to see that you are actually skin-to-skin with your baby (e.g. PWCC, FWCC and Front double hammock). When you are hot, condensation may develop between you and baby when you are skin-to-skin. This can easily be fixed by placing a baby cloth where the condensation occurs. When you babywear the summer heat, there are two things you must always pay attention to: the child’s temperature and sun protection of the child. If you’re in the shade, it’s both a cool place and you’re out of the sun’s direct rays. Therefore, the shade is your friend when you babywear in the summer heat. Unfortunately, it is not possible to find shade everywhere on a hot summer day. But then you can easily bring with you your own shade – an umbrella. 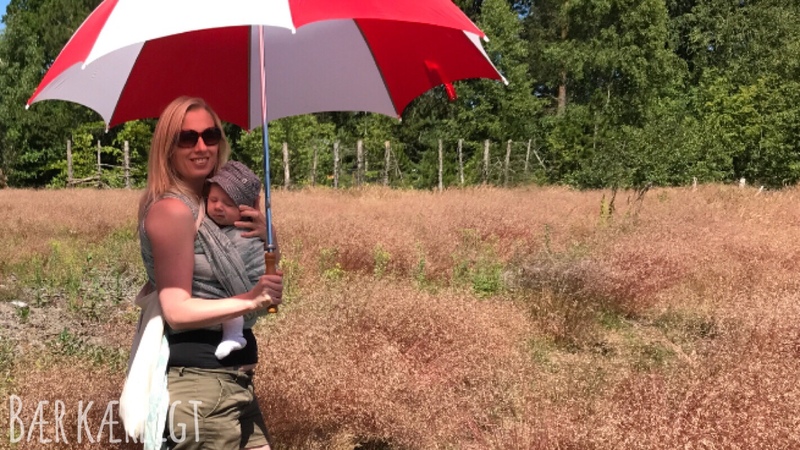 When the sun burns, you can use an umbrella to protect both you and baby by walking under a raised umbrella – and it works for both front and back carries. Now I started out saying that there are no materials that magically make the heat disappear – and I stick to that point. However, there are still differences that are worth considering in relation to materials. For example, some wraps are woven thinner than others – and a thin wrap will feel less hot than a thick wrap. Silk and linen in a wrap will give a thinner and lighter wrap than a 100% cotton wrap – and this may be experienced as less hot as well. You can read more about materials in woven wraps HERE. Strechy wraps are mostly cotton, but are also now being made with for example bamboo, which will also feel less warm during the summer. The same goes for the materials that you dress yourself and your baby in. Thin and light materials – with a little absorption, so the warmth and condensation we make are absorbed and we are not moist on the skin. As mentioned before, each layer of wrap/carrier must be counted as 1 layer of clothing. Therefore, it is obvious to think about how many layers of fabric you wrap about yourself and your baby. For example, the typical carry in a strechy wrap (PWCC) has 3 layers of fabric around you and your baby – 3 extra layers of fabric – and that is really hot on a summer day. If you instead use the carry FWCC with your stretchy wrap, there is only 1 layer of fabric around the baby. The same goes for woven wraps and backcarries, e.g. a rucksack carry also has only 1 layer of fabric around the baby. I am personally not a fan of sunscreen for very small babies. But, of course, it is better to put on sunscreen than that baby’s skin is overexposed to the sun. So are there areas where baby’s skin is not protected by clothes, wrap or bonnet – make sure to use sunscreen. As well as your own skin. Make sure to keep yourself and your baby hydrated. In the wrap, the baby has easy access to nurse in front carries, and it is also easy to give baby a bottle in the wrap. Back carries make it a little harder, a larger child (i.e. over 1 year) will be able to hold and drink a drink cap with a spout if you hand it over your back. Remember to bring something to drink for yourself as well.